seasoned them up with some lime juice, a little green seasoning, salt, black pepper and such. while they sat in the seasoning, she prepared a little batter station. she cracked an egg in a bowl. beat it up like it owed her money. added some milk, and that was one stop. she crushed them both, mixed them up in a bowl and placed the mixture in the line up. and finally into the cornflakes and tortilla chips. it was now time to whip out a gadget that i swore would not come out until the sentence "ah would hail yuh in a lil bit. ah now headin' to de gym." came back into my daily conversations. since it did, it was safe. bring out de deep fryer!! then down into the oil for just a little bit. the shrimp was already cooked, and seafood doesn't take long to cook in general. when they came out they were crispy, golden brown and ready. now to build the sandwiches. she took out some iceberg lettuce, tomatoes, ketchup and mayo. for her sandwich, she went with her favourite: oven classics country loaf with cornmeal. her triple decker seafood sandwich looked inviting. i requested garlic bread from the bakery, which made the mayo redundant. so she left it out for me, but added a slight touch of mustard and a little pepper. it was a curiously different experience, and a tasty one at that. i'll be tryin this one out myself sometime in the future. When I was younger, a provision plate would comprise at least 5 different ground provisions plus dumplings. Some of the provisions were tastier than others. Nice thing about cooking your own food as an adult is that you can now pick and choose exactly what goes on your plate. 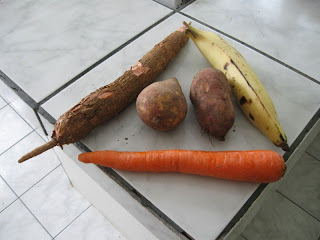 So since I started cooking, provisions for me came down to sweet potato, carrots and plantain. This was after trying the full smörgåsbord: Yam, green fig (too tough to prepare), cassava (no excuse here), eddoes (redundant), potato (redundant) and dasheen (more like dash out). Today I put together a minor provisions plate with smoked herring. 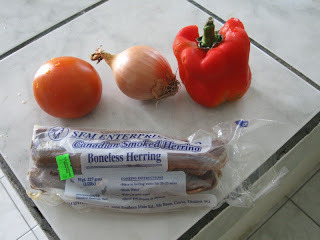 The first thing you should do is get some water boiling for the smoked herring. I use a boneless brand from Tru Valu. This time I used two packs. While the water heats up, cut up your veggies of choice. I'm a tomato man, so you know that's a big part of my mix. Onions and pimientoes (not pictured) are also essential. Green pepper could get in there too. I like my smoked herring chunky, so I cut my stuff up big. 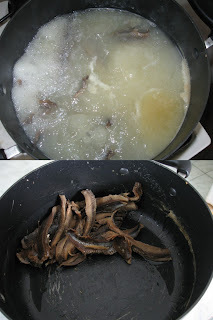 Drop the smoked herring into the boiling water for about 20 minutes. It's a very salty piece of meat, so you'll see cloudy water and salt residue after you empty the pot. The fish will also be quite a bit smaller. Pour some cold water on to the smoked herring to cool it down for the next part. Now empty the pot. Just get in there and mash it up with your hands. No need to be delicate. 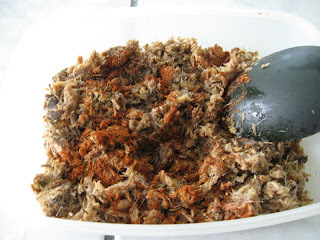 A little note here: For quite a while I was under the perception that you had to strain the salt out of the smoked herring. So I used to soak, empty, and squeeze a few times. Don't do that. You'll take the very flavor out of the fish along with the salt. Just the single boil and drain is fine. Now season up the smoked herring. Fresh seasoning or bottled seasoning is fine, but I went mostly dry this time. I added the usual black pepper, garlic & parsley blend, cayenne pepper for a little snap, and paprika. My green seasoning is there, but I mostly drained the preservative vinegar liquid into the fish. Lime or lemon juice would have been just as good. Not too much, though...remember this isn't fresh fish. Mix it up and get it ready for the pot. By now you should have started to sautee your veggies. Here's a crucial point, though: When you're making smoked herring for bake, you want it to be relatively dry. Keep the fire higher and use less oil. Drain your veggie bowl of tomato juice. Cook up quick. ....and I used some ketchup for sauce and taste. You really want a guide to peeling and boiling provisions, boy? Next time, perhaps...when we use more finicky provisions, like green fig. Only special thing I did here was emulate quincy's Butter Cassava, but with different seasoning. Sweet potato, carrots and plantain are the base. And here's the final result. I made it on Saturday and there's still some left in the fridge. It went down really well. for me, breakfast during the week is generally non existent. so on some weekends, i try to make up by takin the time to make something nice to start the day. here's something that i thought was worth a try. started by chopping some mushrooms and onions. then took them to the frying pan with a little cooking butter. i prefer to use cooking butter so that i don't have to use additional salt. i put that aside in a plate for now. next... egg. now i am particular about eggs. i have to season them up good to handle them. no doubt, my three boys and me beat these three eggs as if they owed us money. seasoned them up real nice. i sprinkled in just a little parmesan cheese. not much at all. don't want the eggs to be too cheesy. dropped them in and scrambled them well. it may not be "proper" cooking practice, but i like my eggs a little over cooked. just when they start getting a little brown. just my preference. these wraps come in handy. garlic flavoured, so you get that nice herb taste. when they came off the heat, i dropped some eggs on them, topped the eggs with the sauted mushrooms and onions then took out this 6 cheese mix. mozzarella, smoked provolone, asiago, parmesan, romano and fontina. topped it real nice. then i drizzled a little pepper sauce on top more for the flavour than for the heat. also to add just a little colour to the presentation. the roll style worked best fot this one. all in all, a decent sunday morning starter fuh me. this is my crock pot. ah love it! slow cookin is a sure way to make a tasty dish. season the pot well, and the result would be succulent, tasty meals like nothing else. so i took it down to deal with a matter of beefy proportions. i took out some seasoned beef cubes and cut them into thinner pieces. 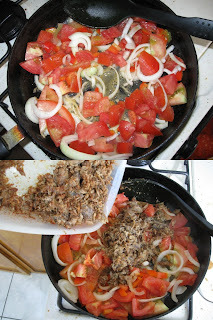 while i was in a choppy mode, i cut up some onion, sweet pepper, mushroom and tomato too. then i put a little vegetable oil in a frying pan. this was a little too much, so i had to pour out the excess. well turnin pot and taking pics at the same time isn't easy. this was a little more like it. 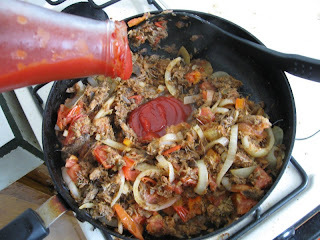 next i put the beef into the frying pan to give it a little colour and to open up some flavours. one such flavour, garlic powder. right. browned and coated nicely with the garlic powder. time to drop it into the crock pot. from the time i add the first ingredient, i switch the pot on. can't say that that's how it is supposed to be, but it's what i do and it works for me. added some onions to it. i put the onions in for the long haul so they would break down into the sauce. oh ho... sauce. to start it, i reached for my trusty maggie cubes. 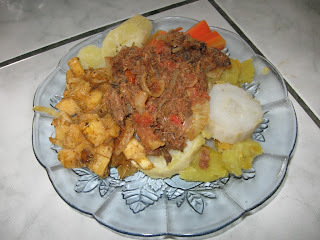 two beef and two vegetable cubes. dissolved them in hot water and made a broth. then i gave it a quick stir... i don't know why. it just seemed like a chef-like thing to do. i put in the tomato early too, so they could lend their qualities to the sauce as well. a1 sauce adds a nice flavour to meats. and yuh know the drill. "if yuh don't have golden ray, boil an egg or something." 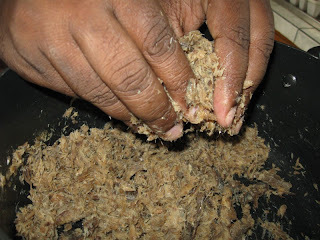 a little cooking butter for that rich creole flavour. just a dash of all purpose. a shake of black pepper. then the pepper was planted. no doubt he's going to pop in there and help make it spicy. time to cover up and forget it for a while. the crock pot has a low and a high setting. you can actually put something on, put it on low, go to work and leave it to bubble. then get home just in time to turn it off, dish it out and eat. you can also put it on at night, go to sleep, then wake up to some tasty cooked food. this time around, i put it on the high setting, which would bubble for 3 hours or so. two and a half hours later, the pot was approaching completion. it was time to add the sweet peppers and mushrooms in. end result, succulent beef which went nice on a bed of jasmine rice. instant thumbs up from the curious mouth. bottom line, get a slow cooker. it's well worth it.